The Regime’s End is Near but What Comes After? 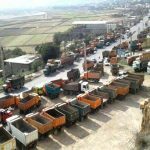 Archive Photo: Truck Drivers continue on strike on their 10th day, due to high prices and Iranian regime’s extensive corruption. The mullahs are staring down the barrel of a revolution, a similar barrel the Shah faced in 1979. A wave of protests, which began with a nationwide uprising in December 2017 and January 2018, has shown no sign of abating. 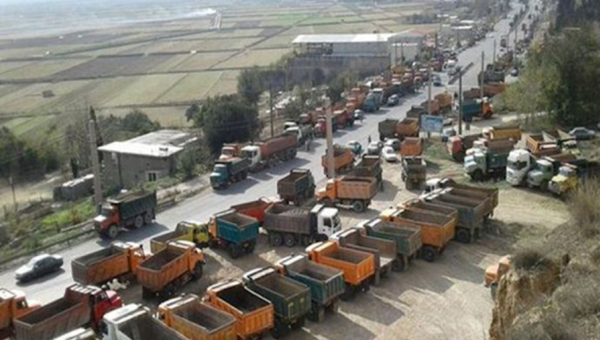 The most recent truck driver’s protest has run for more than 18 consecutive days, despite vicious threats against the strikers from the regime. Iranian protesters in #Sweden gathered in support of Iran's uprisings & strikes. The strike demonstrated the full extent of the regime’s weakened position in power. Not only did the mullahs’ repressive and violent strategies for dealing with the protests fail to curb the dissent, but the truck drivers drew support from the Iranian people, both at home and abroad. “The severe downfall in the national currency value and skyrocketing prices for basic necessities indicate that the country is not being governed properly”, said Golamreza Heydari a member of the Iranian regime’s parliament. Heydari added, “the way the country is running is that all the power is in one place and others are held accountable”. The international press is reporting water shortages, corruption, a media crackdown, executions, the arrest of political opponents and extensive economic mismanagement from the clerical regime. Concern from within the regime, a breakdown of effective governance and rising determination to change the status quo from the Iranian people all suggest that the regime’s end is near. The answer to the question of what comes after the fall of the regime lies in the viable alternative to the mullahs. The People’s Mujahedin Organisation of Iran (MEK) and the President-elect of the Iranian resistance, Maryam Rajavi, have a cohesive ten-point plan to bring democracy and tolerance to Iran. The MEK grew out of the Iranian people’s resistance to the regime’s human rights violations. It refused to legitimize a ruthless dictatorship shrouded in religious rule. This steadfast refusal to live under a religious dictatorship made the MEK a beacon for Iran’s youth. The group rapidly expanded and has drawn support from politicians and journalists from across the globe. For nearly 40 years, the MEK has worked to establish itself as a viable and organized alternative to the arbitrary rule of the clerical regime. It has embraced democratic values of religious tolerance and an independent judiciary, drawing support from human rights groups and supporters of freedom. One of the strongest indicators that the MEK and Maryam Rajavi represent a very real alternative to the regime is that the regime itself feels threatened by the opposition group. Former Mayor of New York, Rudy Giuliani recently asked, “Who has the best conditions of seeking to overthrow [the regime] and the ability to turn this potential into a reality?” The answer, he said, is “the MEK and this is something that the Iranian regime Supreme Leader Ali Khamenei has stressed upon repeatedly. So, it is necessary that we identify them, raise awareness about them”. The regime perpetuates the idea that in Iran there are only two possible choices. One is to accept their clerical regime at face value, acknowledging its existence and tolerating its violence and dangerous behavior. The other option, it argues, is a full-scale military conflict (likely involving the assistance or presence of a foreign military in Iran), whereby if the opposition groups win, they can usher in a new period of democracy. But this is not the reality. The MEK and Maryam Rajavi do not stand for a war with the regime. They do not want to see a further conflict in Iran. I urge the world’s governments to stop their political and economic relations with the Iranian regime unless the regime ends torture and executions of prisoners and abandons its involvement in terrorism. Instead, the MEK has worked tirelessly to explore other ways to further their political goals. Over the last 20 years, Maryam Rajavi and the MEK have spread their message across the world, drawing support from the international community including MPs, former ministers, and military commanders. Initially, the group worked on reversing the unjustified labeling of the MEK as terrorists, a regime-concocted lie disseminated through its official mouthpieces and backchannels. The MEK secured its removal from several countries’ blacklists between 2008 and 2012. It is now working with the international community to fight the regime’s support of international terrorism. It is also one of the loudest voices calling for justice for the families of victims who were executed in the 1988 massacre. In the summer of 1988, the regime executed more than 30,000 political prisoners, mainly MEK activists. Those responsible have never been brought to justice, and several hold senior positions in the regime leadership today. Despite what the regime touts, there are not merely two options for Iran. A third option exists and is increasingly looking like the most likely outcome. The third option sees the Iranian people rise up against their oppressors in a wave of protests. This wave of discontent combined with international economic and political sanctions erodes the mullahs’ positions of power and sees their ultimate overthrow. Then Iran can be free. The MEK will oversee the implementation of democracy and free and fair elections. Only then, when a democratically elected government sits in the office in Tehran, can Iran make strides towards its brighter, better future.